Why Can’t All Those Disposable Ballpoint Pens that Are Overrunning My Office be Refillable? According to the EPA, Americans throw away 1.6 billion disposable pens every year. Add the rest of the world, multiply by over 50 years of writing with disposable pens, and that’s a lot of metal and plastic waste ending up in landfill! I suspect it’s just the tip of the iceberg, given the piles of disposable pens that many of us haven’t thrown out yet. Not to mention the refillable pens that we never take the trouble to refill. The strange thing is, I don’t remember buying any of them. They seem to follow me home from meetings, events, hotels, and conferences, and end up staying permanently. Judging from the number of disposable pens in every nook and cranny of my home, I suspect that some of them are reproducing when I’m not looking! How Did I Get So Many Disposable Pens? I would guess that many of you are experiencing similar disposable pen proliferation. How did this happen? And what can we do to prevent further waste? For better or worse, our dependence on computers, tablets and smartphones means that we are not writing that much anymore. When my Esterbrook ran dry, I gingerly opened a bottle of ink, dipped in the nib, and slurped up another barrel-full. 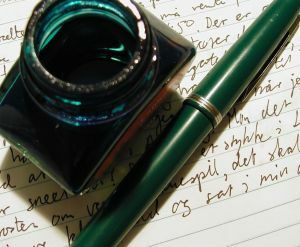 Eventually, ink bottles were replaced by less messy cartridges, and most people used ballpoint pens for everyday writing. But back then, we would buy one ballpoint pen and purchase refills as needed. Fast forward to the age of Bic, and the advent of cheap, disposable pens. New habits were formed, and ballpoint pens (not refills) were soon sold by the pack. (I’m not sure that Gen Y’s are even aware that ballpoint pens can be refilled.) Now, everywhere we turn, someone is handing us an inexpensive pen with their company name on it. Many end up in a drawer, pencil cup or purse, never to see the light of day or fulfill their intended function. Others are pitched in the trash when they run dry. (Would we throw away a flashlight when the batteries die?) Even if we wanted to purchase one, refills are not widely available, and it’s difficult to find exactly the right type and size for each pen (unlike more uniform AA, AAA, C and D batteries). In the battle against disposable pen proliferation, I am clearly the victim and the perpetrator. As a dedicated Waste Watcher, the solution starts with me! First, I’m going to clean house and try to find good homes for as many of my 141 disposable pens as I can. Perhaps some will end up in art projects by the Pen Guy and other artists. With the help of Mr. Right (see “Taming a Wasteful Spouse” on this site), I will attempt to limit us to two refillable pens per room, pocket or purse. When people offer me a promotional pen, no matter how slick or cute, I will decline and tell them why. They probably haven’t considered the environmental consequences of their giveaways. I will ask the bookstore at the college where I work to carry refills and display them prominently next to the ballpoint pens. And I just might challenge my Green Marketing students to last a whole semester with one pair of refillable pens, like the Pilot B2P made from recycled bottles. Want To Join Me in the Fight Against Disposable Pen Proliferation? Are pens littering your life? What ideas do you have for reducing disposable pen proliferation? What other waste-related pet peeves are keeping you awake at night? 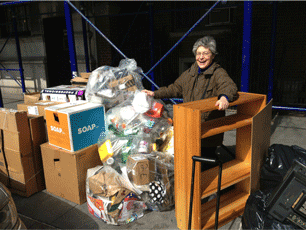 Frugal by nature, and an environmentalist since the ’60s, Fredrica Rudell teaches Consumer Behavior and Green Marketing courses at Iona College, and is very involved with sustainability activities on campus. (The views expressed on this website are hers alone, and not those of her employer.) Read more stories from Fredrica HERE. Erica, interesting to focus on a small part of a bigger issue. To achieve “0” waste, there are many individual parts of the waste stream, in addition to pens, that we can see as challenges as we dispose them everyday. How is it best to deal with it ? Should there be manufacturer (or sector wide) return programs; how to return the items-drop off at retailers (think of the logistics of that as a retailer ! Propose pen returns to Staples, etc…)-although there are many private firms that accept them, at least some retailers/municipalities are “taking back ” electronics (Best Buy, etc..) and CFL bulbs (Home Depot) or curbside pick up (such as for all plastics in NYC-think of the cost/logistics of that from a municipal govt POV); someone/eqt needs to sort through this stuff if recycled together. MRF separation technology took a few yrs to get optimized for the current spectrum of materials. Not a small set of issues. Forgetting about whether or not more restrictive regulations may be feasible/likely in the near future, the bigger waste management and other progressive firms are starting to tackle the supply chain, packaging design, collection/re use issues, but there will be many years of development to get to including a solution to the pen issue. Let’s hope posts like these will motivate the inclusion of more items, including pens, for recycling/composting (pens too) or collection/recycling systems. People such as yourself are useful catalysts to contacts the manufacturers of the products that intrigue you to start a dialogue and let them know you are interested. Maybe they’re working on it. Maybe you’re the employee they want/need to make the change you envision. 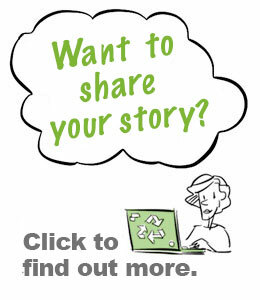 Identifying a challenge is the first step to working towards its solution-update us ! Couldn’t agree more, Ben. Pens are just one piece of the waste stream, and msut be viewed in a larger context of resource conservation and product reuse, repair, return, recycling, rot, etc. Systems designed to accomplish these goals may be sponsored by municipalities, private firms, or the companies themselves (e.g., through extended producer responsibility). 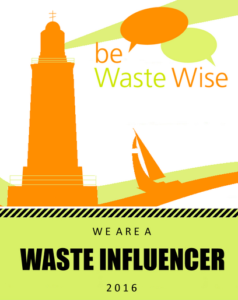 WeHateToWaste.com provides a unique forum for like-minded consumers to share stories, information and ideas (and the occasional pet peeve). And as you point out, members of this community can (and do) serve as catalysts for change. I read this post this morning and just noticed a poster in the kitchen on my floor at my office encouraging people at my company to recycle their writing instruments. They have a collection point here for the Terracycle Writing Instruments Brigade (http://www.terracycle.com/en-US/brigades/writing-instruments-brigade-r.html). Sanford (creators of Papermate and Sharpie products) have partnered with Terracycle to give a second life to unwanted writing instruments. You can recycle pens, pen caps, mechanical pencils, and markers and marker caps which will be turned into plastic storage bins. It’s free for organizations to participate and they are awarded points for each item collected, which can be redeemed for charitable gifts or a payment to a school/non-profit of your choice. It doesn’t address the issue of why individuals have so many disposable pens in the first place, but it can help clear the clutter to make way for a couple good-quality refillable instruments! Thanks for sharing this solution, Alison! I didn’t know that Terracycle had expanded its collection program to pens (and many other items, including cell phones). I see that only certain models qualify, and individuals must find (or start) a “Brigade” to collect the pens. But with the right signage, a collection box at school or work can raise awareness of disposable pen proliferation AND give folks a convenient way to reduce it. Thanks Alison! I just signed up and plan to set out several boxes at my school to start recycling these items! Good to see that others have identified pens as an issue. I fear that as we all migrate online more and more, the pens will keep adding up and up until someone figures out we don’t need any more pens. Then what will happen with the pens that we have collected? Has anyone tried to upcycle pens? Figure out a new use? Hand puppets anyone? Pens that double as chopsticks that you can write your own fortune with? Now we need to turn our attention to mouse pads, and CD racks. I did not know either Terracycle included a pen program, good to know because I have supplies for them. A few years back I came to the same conclusion as you Fredrica, and did the same thing: collected all pens at home and then I separated them in two piles, working and non working. For the working pile, I took what I needed for each room (kitchen, offices, kids’ room…) and purses, kept a reserve for later and gave away most of the rest via freecycle to a teacher, happy to load up for her classroom (I also did the exercise with pencils, highlighters, erasers, rubber bands…). I had not bought any of these items, they all came from work, agencies, free goodies…. and don’t plan on buying any given all the free supply readily available at all times (in stores, banks…). To this date though, I don’t have a solution for the pile of not-working pens, and they still sit in a shoe box. Added to my list of need-to-figure-out-recycling-or-disposal items. So I will check again Terracycle. Thanks for the tip Alison! Fredrica — I couldn’t help myself! I spoke at an event the other nite, and at the end of the evening, I spied a pile of pens left by the sponsor. They would have been thrown away if I hadn’t rescued them. There were so many, they needed their own repurposed coffee cup to contain them in my office. Any advice for an inveterate pen rescuer? Like Elodie, I was planning to offer my working pens on Freecycle. Last week I posted some loose leaf binders there, and got responses from no less than five teachers! I was able to distribute about three dozen binders for use by teachers and students. If they can use the pens, I’ll pack them up and enclose information about how to start a Terracycle collection Brigade at their schools. If you know a teacher or live near a school, I suppose you could cut out the (Freecycle) middleman by donating your pen rescues directly. Nice idea, Fredrica. In fact, I live right around the corner from a public high school. In fact, I have given loose leaf binders and such to them in the past. Never thought about the pens, though…. I guess I’ve been accepting as a fact of life that we all have to live our lives overtaken by pens! Those of you interested in donating your used disposable pens, considering your local school. Teachers LOVE to keep a jar of pens for those students who can’t manage to bring one to class. You can be sure that they will be used up! Teachers LOVE getting free classroom supplies. Consider donating your pens to your local school. You can be sure they will be used up! Also, when I was living in London there were multiple borough sponsored give and take days. As a local artist I was the grateful recipient of many unwanted office supplies from local business and other organizations. Is it possible they have something like that where you live? One pen manufacturer was using USDA Certified Biobased plastic for their pen barrels; that was a real innovation. But when it comes to pens and me, less is definitely more. Having donated a shoebox full of working ballpoints to a teacher via Freecycle, I am now on a pen diet, using only a few favorite refillable pens. I try to keep just one or two in each location–on the desk, by the phone, in my purse, etc. So far, so good! In the case of the pens that you described, they are ‘biobased’. That doesn’t mean they will biodegrade. (It’s quite confusing.) All it means is that some parts of it (or sometimes the whole thing, but with a pen that would be hard to believe) were made from plant-based ingredients. So the benefit would be the CO2 the plants had absorbed while growing originally. There’s a lot more about this at BioPreferred.gov , home of the USDA’s Certified Biobased label which we at J. Ottman Consulting (proudly) helped to introduce. Fredrica, I’d really enjoy seeing a follow-up post about how you did end up eliminating some of the pens in your life and how you students took the challenge of using a refillable ballpoint pen. And if the bookstore did put in the refillable pen next to the disposable pens. I think the conclusion to this story will be as interesting as the beginning! I love this article. In fact, I’ve thought about my disposable pen dilemma for a few years now. You see, I become attached to specific pens, and too, I don’t recall paying for them. When I obtain a pen, usually by free give-away, if I like the pen I tend to uses it considerably. Then, when the ink runs dry, I’m torn and cannot bring myself to trash it. I do throw out the used ink needle thingy and keep the remaining pen, and springs and caps etc. I think I’ll eventually buy replacement ink parts but never do and this is because the replacements hardly ever fit the pen I’ve become accustomed to. So what do you do when you have a pen that’s run dry, that your really love to use, but unable to find an ink replacement part? 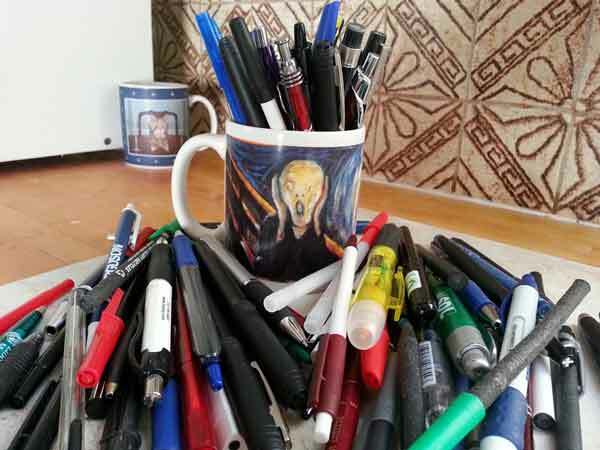 I had this conversation with a friend the other day who was lamenting about the number of pens in his drawer that were promo give-aways that ran out of ink after about 4 weeks. I felt horrible given that our company sells enviro friendly give-aways including pens. So, I started the search to find out how we could help to remedy the situation when I found this blog! Recycling depots like terracycle offer a great incentive for recycling pens which we will promote and direct people to on our site as well. However, I agree that we need to look at being able to offer ink replacement of some kind for those special pens that you don’t want to recycle. I’m the moderator on this blog. I have to say when Fredrica’s draft showed up in my in-box I thought the topic was kind of trivial. But once we posted it, I was amazed to see how much of a problem having so many pens is for people. Yes, I’ve taken pens home from conferences only to find out they ran out after a very short amount of time – and then felt badly that I had to throw so many pens away. So that obviously reflects poorly on the company. Glad you are interested in more eco ways of resolving the problem for your clients. Doing so will help burnish their image, and if the solutions result in folks keeping their pens around longer, will only result in a better ROI – that they will thank you for. Good luck with your product improvements! Glad the conversation continues. I’ve been meaning to update everyone on my progress since the purge. 2) I followed up with the college bookstore, but apparently their stationery and supplies distributor does not carry refills! 3) I decided to do some observational research at Staples. I found hundreds of ballpoint pens on display, but only one brand of refills was located near its pen “parent.” However, across the aisle (and easy to miss) was one small carousel with various types of ball point pen refills hanging in no particular order. There was a booklet to help you find the right refill for each model pen, but the assortment was clearly limited. I did manage to find a pack of G2 refills for the Pilot “B2P” (Bottle2Pen)gel roller pen (though not in the color or thickness desired). The pens sold in a pack of three for $6.49, and the refills were $3.29 for two. So if my math is correct, in addition to the reduced plastic waste, I can save about 52 cents each time I use a refill instead of buying a new pen. I’m sure the savings would be higher for better quality pens, including those that are lying in drawers waiting to be refilled and pressed back into service. Clearly, there is room for improvement when it comes to consumer awareness of refills and willingness to trade off convenience of disposability for reduced waste. And pen producers and retailers should do a better job with design (how about universal standards or customizable refills), promotion and accessibility. As an addendum, I thought of one way to address the points in my last paragraph: Pilot seems to be on the right track with its B2P pens, which are made from 89% recycled content, meet ISO 14001 and 14021 standards, etc. The company is even an official sponsor of Keep America Beautiful. Why not sell B2P’s in a pack of one pen with two refills, instead of three pens and no refills? In addition to the educational value for those who have never refilled a ball point pen, the convenience of having the refills in the same package might help consumers overcome the temptation to discard pens when they run out of ink. Hopefully the practice of including at least one refill in the package would spread to other models and pen companies. Nice idea, Fredrica. While the disposable ballpoint pen people are en route to making their products ‘refillable’ why not let other businesses get inspired to do the same? For example, why can’t every bottle of Windex come with a refill pouch on the neck of the bottle. “Buy One for a little extra $$. Lasts Twice as Long”. As I mentioned in my comment above, anyone who buys pens as a premium item should appreciate having their name on folks desks twice as long — or three times as long for just a little extra money, right? Pingback:	Stop Throwning Away Pens! I still use a refillable fountain pen, I had at school 28 years ago! I love the way my fountain pen writes. I do my best to refuse ‘take-away pens’. Good post! However, even with refills, where do the used-up ballpoint refills go? Can we recycle them? I can’t seem to find the recycling symbol or any letters (PET, for example). I’m 21, love fountain pens (some gen Y like ’em too! ), but also have a Zebra M-701 ballpoint pen. Fountain pens are good, as you mentioned. But again, where should I put these refills? This light bulb just hit me! I too, have been buying disposable pens, some with recycled plastic, some not. I am happy to report that the Zebra Eco pens that I have been buying are refillable – unbeknownst to me – so now I think I’m good! It’s really about being mindful – even for someone like me, who thinks about this stuff all the time! Love your site; I just found it! While I like the idea of using a refillable pen, in truth I’ve never needed more pens than I find on the ground while picking up trash, that still write. I have the same problem with reusable vs. disposable lighters – I actually have an empty refillable lighter sitting in my kitchen drawer, but I’ve never bought lighter fluid for it because so far I’ve always found another disposable lighter laying on the ground at a park or festival before the last one I’ve been using runs out. Obviously using “trash” I find on the ground until it is used up beats buying anything. On the other hand I get attached to pens sometimes and then when they “die” it makes me sad, so I sort of wish I did have reasonable cause to go with a reusable fountain pen and ink jar instead. Good article (though not a problem I seem to have) and interesting comments by others. No I am not interested in stopping a source of advertisement from any company trying to make it in this economy. I am interested in finding ways to replace the ink in these pens as some of them are very nice to use. I just don’t take as many pens (141 holy moly!) and would like to keep using them. 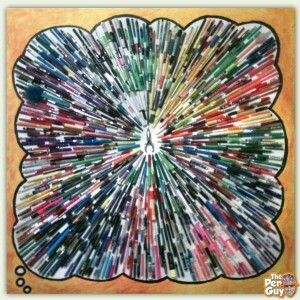 Tell me where I can find ink or ink cartridges and ‘ll be ok.
Great post! Truth be told I have never really thought about what happens to old pens, and can’t even really think about what I do with my old pens that don’t work anymore. For the most part I think they really do just sit in an old drawer somewhere. But when reading this post I thought about two things. One, about the millions of pens that do end up in the trash/landfill. And two, about how stores for the most part sell pens in bulk. It is cheaper and a better deal to buy a pack of 15 pens than two pens. And would it at all make a difference if we switched that around? If it was cheaper to just buy the two pens, would that help reduce the amount of disposable pens that end up in the trash? Interesting. However, the fountain pen hobby is another rabbit hole 😉 I have spent thousands of dollars on high end fountain pens and am still not satisfied! Dear all, Yes pen waste is becoming alarming. We need to wake up. We individual must change first. I already changed to ink fountain pen without catridge. OR cartridge must be filled from ink bottle.. don’t purchase cartridge. Use pencil most of the time which is eco-friendly. Get into practice, that is all. Hey, glad to see this problem highlighted and whats even better is the enormous response it has generated. With over 2 billion stationery pcs being manufactured alone in my country, its a scary thought of the plastic being added on a daily basis. We have been working on this problem for quite sometime back home and have now developed and switched to recycled kraft paper based eco friendly pens and pen pencils. It replaces the plastic barrel of the pens with recycled paper tubes while maintaining the durability, aesthetics and economic benefits of plastic stationery. It might be a small product but it has a scope of generating massive impact. Few small steps eventually make a giant leap. whenever there is a big issue of waste many people begin to thin of big causes. i once remembered that iv been using a lot of pens but i have not focused on its disposal. mostly the pens do not even get exhausted and it gets missing. so i decided to undertake a research project on plastic waste disposal focusing on plastic pens in academic institutions. i have come to realized a lot of people buy at least 5 pens within a month in the various institutions i used as a case study. it is interesting to know the amount of money students in particular spend on pens per year and it may surprise you that how they are properly disposed. I had the same thoughts this week as I was trying to insert a generic “snip to fit” refill into an attractive (but dead) ball point pen that followed us home from a hotel. Not only did I fail to snip it to the right size, but it was too skinny for the spring in the barrel and would have slipped through. Then I realized that the generic refill was not going to be as pleasant to write with as the one that came with the pen. If pens had a uniform sizing system (like AA, AAA batteries), and a reasonable range of tips (gel, etc. ), perhaps I would be able to find an appropriate refill for that one. I’m with you in putting pressure on the “pen industrial complex” to do the right thing! Back in the 60’s Bic ballpoints used to work – 3 hour exams with one pen was no trouble. But now, desire for turnover has made them doctor their ink so that the pens will not work for long, forcing us to buy more. They are diabolical, and I won’t use them again. The question about pen refills is “Are refillable pens really any better for the environment than disposable pens?” I don’t have the answer but I do know that most pen refills sold in stores are for rollerball/gel pens. They usually only come with 2 or 3 in a package and they generally don’t last very long. Your average disposable ballpoint BIC could last longer than all the refills combined. And unless the refillable pen is a high-quality pen, it will be showing its wear after a few refills and probably need to be replaced. From purely a resource perspective, I would say more resources are used going the refillable pen route when you take into account the pen, refills, and packaging. A fountain pen can change things drastically. A high end fountain pen can last a lifetime. The ink can come out of a recyclable bottle with totally recyclable packaging. But pricing will prevent that from ever becoming a widespread reality. You can buy a pack of 60 disposable pens for as little as $3 and they will far outlast a bottle of ink several times over. There is absolutely no way to compete with that. I am having the same problem. My daughter is in 6th std. The school is telling the pupils to use Gel pen and not an ink pen. However, the refill works for only one week or even less. Now imagine total working weeks for the students. Even if I consider 200 weeks per year, means 200 refills approximately. There are approximately 600 students in one school. Now total refill plastic waste generated in one school is: 200 x 600 = 120,000. In our vicinity we have at least 20 schools. So 20 x 120,000 = 2,400,000. It shows 2.5 millions refills used just in my vicinity. After it is used, it is dumped in garbage and never reused. So environmentally it is creating huge waste without even we realizing it due to simplicity to used but by not choice but by force. The gel ink is not available for refill so I need to purchase refill every time. When I was in school, we used INK pens. I used them for 12 years without any waste being created. But now it is very scary. Someone just turned me on to #4B pencils. They write just as dark as a pen! They will certainly last a lot longer.